Are you looking for a delicious seafood recipe with a difference? If you are, you’ve found it! 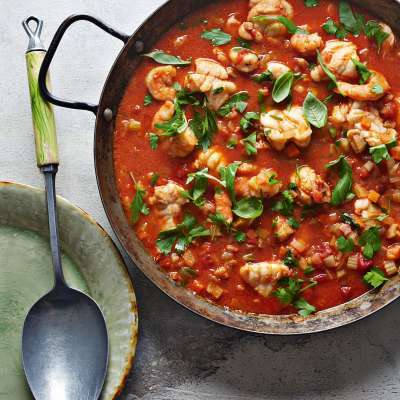 Here’s my prawn & monkfish soup for you to enjoy. Once considered poor man’s food, Italian fish soup can now be found in the best restaurants along the Adriatic coast. From Trieste to Puglia you’ll find the so-called brodetti (broths), although they vary from region to region. We had countless bowlfuls on our coastal journey; each was unique and all were delicious. 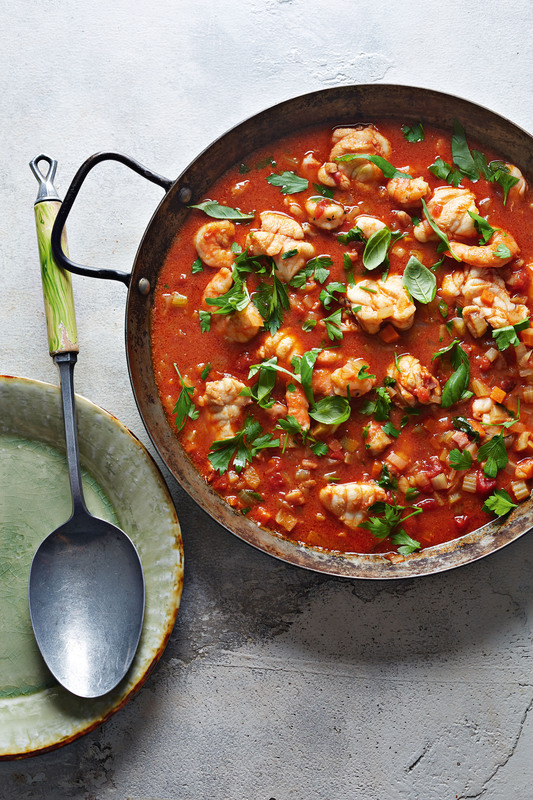 Here I’ve used prawns and monkfish, but any white fish would work just as well. Serve with plenty of fresh crusty bread for dunking. Feast your eyes on the finest prawn & monkfish soup! It’s straightforward and fun to make this great dish. Simply follow the instructions below and get the perfect result. Heat the oil in a medium pan over a medium heat. Add the onion and fry for 5 minutes, stirring occasionally. Add the pancetta, celery, fennel and carrot and fry for 2 minutes, stirring. Increase the heat to high. Add the tomatoes, wine, stock, basil and parsley and bring to the boil. Reduce the heat to medium. Simmer for 10 minutes, stirring occasionally, and season with salt and pepper. Reduce the heat to low and add the monkfish. Simmer very gently for 5 minutes, stirring occasionally, then add the prawns and cook for 5 minutes. Ladle the soup into bowls and garnish with parsley and basil leaves. 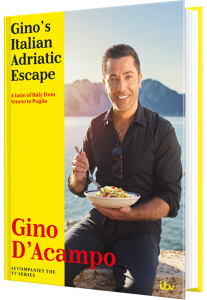 Once you’re done, simply sit back and enjoy your prawn & monkfish soup and don’t forget to check out other great authentic Italian recipes including great antipasti recipes, Italian pasta recipes, Italian soup recipes, Italian beef dishes and authentic pizza recipes.